Growing Almonds With Little Water. Is it Possible? Much was written during California’s recent five-year drought about the amount of water used by almonds. The nuts have become California’s most lucrative agricultural commodity, and a major export product. Long before concerns about water use by almond growers emerged, the industry initiated measures to conserve water by embracing microirrigation systems. It has also become a leader in efforts such as recharging groundwater by flooding almond orchards during winter storms. The water required to grow almonds also grows more than nuts. Other materials from the plant – from the tree itself to the nut hull – are used in a variety of products, with initiatives underway to find new uses for these materials. To explain these initiatives further, Water Deeply recently interviewed Richard Waycott, president and CEO of the Almond Board of California. Water Deeply: The almond industry has invested millions of dollars in water efficiency measures. What has this yielded so far and what more are you hoping to learn? 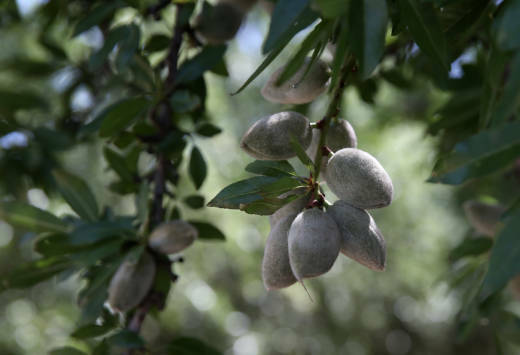 Richard Waycott: Many almond growers have farmed in California for generations, and recognize that water is the lifeblood of California and a key component of responsible farming, essential to growing food. The California almond community began investing in water research in 1982 to determine if a then-new irrigation method – microirrigation – could work in almond orchards without negatively impacting yields. Tested via long-term studies across the growing region, the results were positive and, by targeting water applications directly to the trees’ roots instead of uniformly across the field, farmers conserved water and created other operational efficiencies. This research has resulted in the wide adoption of microirrigation, which today is used by nearly 80 percent of almond farms. This is almost double the California state average of 42 percent of farms using microirrigation. This has helped almond farmers reduce the amount of water it takes to grow a pound of almonds by 33 percent over the past 20 years. While almond farmers have made great strides in the area of irrigation efficiency, there’s more we can do and are doing. The Almond Irrigation Improvement Continuum, created by irrigation experts, is a roadmap for California almond farmers to accelerate adoption of research-based, water-efficient practices and technology. The continuum provides research-based guidance to improve any farmer’s irrigation efficiency by focusing on five key areas: calculating orchard water requirements, measuring applied water, and monitoring irrigation system performance, soil moisture and plant water status. Additionally, to help farmers minimize waste and grow more crop per drop, the Almond Board has developed a free irrigation scheduling tool. Using data from their farms about orchard and irrigation system setup, along with local weather data and other inputs, the calculator generates irrigation schedules including the optimal amount and timing of irrigation. Based on research, this interactive decision-support tool is designed to streamline on-farm decision-making and minimize environmental impacts. Water Deeply: What role is the almond industry playing in advancing groundwater recharge? Waycott: California’s aquifers are collectively the state’s largest water storage system and are used statewide for drinking water and farming. Overreliance on groundwater means that many of the state’s aquifers are under pressure. To support water sustainability in California, almond farmers are exploring how California’s almond orchards can be leveraged to replenish underground aquifers. On-farm groundwater recharge applies excess winter floodwater to dormant orchards, allowing it to seep down and restore groundwater. Water recharged back into those aquifers benefits all Californians, not just farmers. This research is critical to creating more sustainable water resources in California and core to the California almond community’s commitment to continuous improvement. Water Deeply: By your calculations, how much water does it take to grow an almond? And in what other ways is an almond used, besides for the nut itself? Waycott: All food takes water to grow and the water needed to grow an almond tree is similar to that of other fruit and nut trees in California. The water used to grow an almond actually grows four products: The kernel you eat, which is protected by a hull and a shell, as well as the tree. The trees store carbon and are transformed into electricity at the end of their lives; the shells become livestock bedding; and the hulls are nutritious dairy feed, reducing the water needed to grow other feed crops. Almond farmers are committed to finding even more innovative new uses of almond coproducts that can support California in creating a genuine bioeconomy where every byproduct is an input for another valuable product. Current research is exploring using almond hull and shell components as growing medium for mushroom cultivation, producing feed sources for poultry, plastic additives for strength and color, soil amendments for almonds and other crops, supplemental winter food sources for honey bees, and even for brewing beer. Water Deeply: Acreage of almonds planted in California has increased in recent years, with some percentage of this replacing annual crops. Is there a point at which, from a market or water standpoint, there’s an unsustainable number of acres? Waycott: Over the past several years, California as a whole has seen increased plantings of perennial crops – things like fruit trees, nuts and vines – which generally have higher associated values than annual crops. While some have suggested that the shift toward higher-value perennial crops has led to an increase in agricultural water use, according to the California Department of Water Resources the total amount of agricultural water has held steady since 2000 and actually declined over a longer period. When you take a look at our crop specifically, almonds grow on 17 percent of California’s irrigated farmland, but they use only 11 percent of the water California devotes to growing food. California is the most efficient place to grow almonds on the planet. In addition to its ideal Mediterranean climate – essential to growing almonds – California’s Central Valley is home to rich soils, natural resources and infrastructure, and innovative research and technology. Economically, California grows more than 80 percent of the world’s almond supply, which creates a comparative advantage, creating value not just for farmers but for Californians as a whole. According to the California Agricultural Issues Center, the California almond community delivers significant economic value to the state, supporting 104,000 jobs across California and contributing $11 billion to California’s GDP.